The blog of Nov 3rd and subsequent comments brought back memories of Noel Tallowin to some of us. Ian Morgan had a feast of these in c.1975. These are others from that field as there were very many. It is interesting that they have been spotted in a field near Trimsaran this year. As these were from a field on the road from there to Kidwelli about 40 years ago, has it taken this long for them to 'fruit' again? These are the ones left on my front doorstep by Noel. If I could work out how old Christopher was, I could confirm the year! He looks about 12 so that would be 1975. I remember it to be 1975 too, Philip. 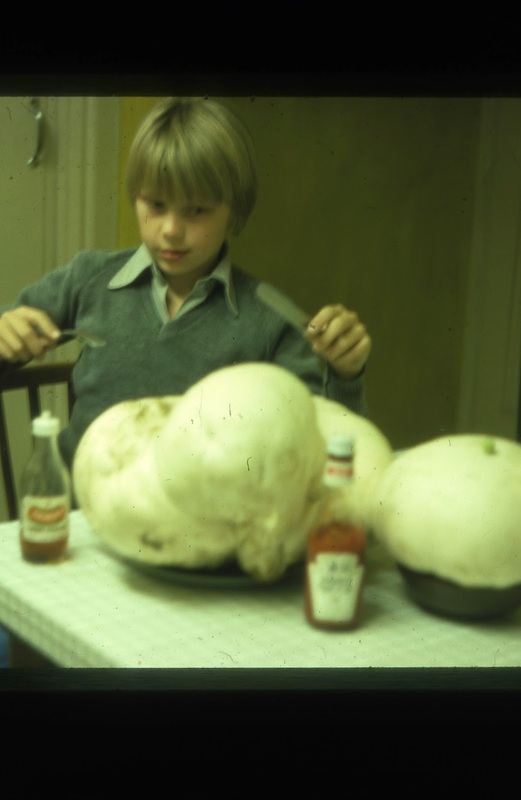 I recall taking my `giant puffball gift` from Noel Tallowin home to my parents and they said, "What`s that! "....and I replied, "Our breakfast". Happy times!